Within 48 hours of being dropped by new Spain coach Luis Enrique, Jordi Alba and Iago Aspas responded on the field by scoring in standout wins for their teams in the Spanish league. Alba scored once, provoked an own-goal and set up two more goals to fuel Barcelona’s 8-2 demolition of Huesca on Sunday, a day after Aspas ensured Celta Vigo surprised Atletico Madrid by sealing a 2-0 victory. Their strong showings came after Luis Enrique left both players, along with Atletico’s Jorge “Koke” Resurreccion, out of his squad for upcoming matches against England and Croatia. The three players appeared to have paid the price for Spain’s disappointing World Cup. Aspas and Koke both missed spot kicks in the penalty shootout with Russia in the round of 16. Luis Enrique took over Spain following the World Cup disappointment. 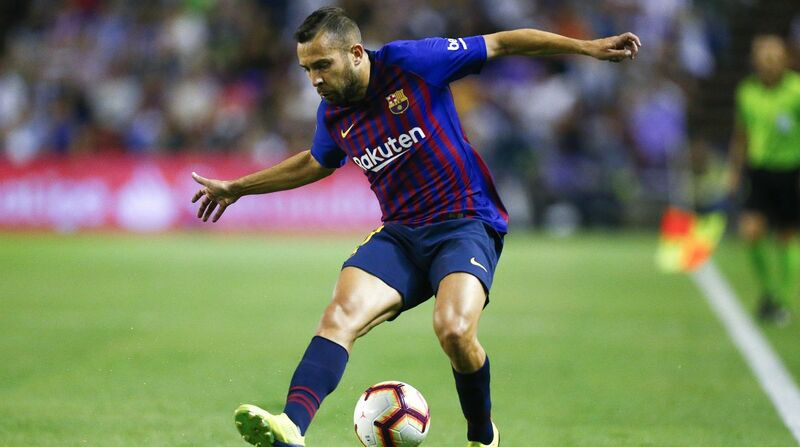 While striker Aspas was a relative newcomer to Spain with six goals in 13 appearances, left back Alba has 66 caps and eight goals, including one in the final of the 2012 European Championship when Spain routed Italy 4-0. Luis Enrique hasn’t publicly given his reasons for dropping the players. He chose Chelsea’s in-form Marcos Alonso over Alba, who he coached at Barcelona for three years. Alba said after the Huesca match that he was surprised to be overlooked by his former manager. “I never spoke poorly of Luis Enrique, I don’t have a bad relationship with him,” Alba said. Aspas responded by slipping between two Atletico defenders to jump and head the ball down off the turf and just inside the post to cap Celta’s win on Saturday. Rarely has a player hoisting a trophy for being the best at his position looked so glum. But it was clear that Keylor Navas took little solace in his award for best goalkeeper in the Champions League last season before kickoff at the Santiago Bernabeu. That was because Navas spent the rest of Real Madrid’s 4-1 win over Leganes on the bench, where he watched goalkeeper Thibaut Courtois make his debut with the reigning European champion on Saturday. Despite having Navas in goal during its run of three straight Champions League titles, Madrid put his No. 1 role into serious doubt after signing Courtois from Chelsea. Karim Benzema and Gareth Bale as the league’s leading scoring pair with seven goals comes as no surprise. That Levante can boast the next highest scoring pair definitely does. Jose Morales and Roger Marti have each scored three times, accounting for all six of their team’s goals. Morales scored twice and Marti once in a 3-0 win at Real Betis in Levante’s season-opener. Morales also scored in a 2-1 loss to Celta Vigo, and Marti had a brace in Sunday’s 2-2 draw with Valencia. Coach Paco Lopez, who turned Levante around after arriving midway through last season, said that his side’s success is based on quick and often risky attacks led by the speedy Morales on the left flank.